My son, Robert, and I were having an argument on the train platform in Avignon. He wanted to stop in Lyon to have a look around and have lunch and I wanted to go straight back to Paris where we had rented an apartment for a few weeks. Robert is a travel writer and I do not see him much except the rare times we can travel together. “Mom,” he said, Lyon is the food capital of France. 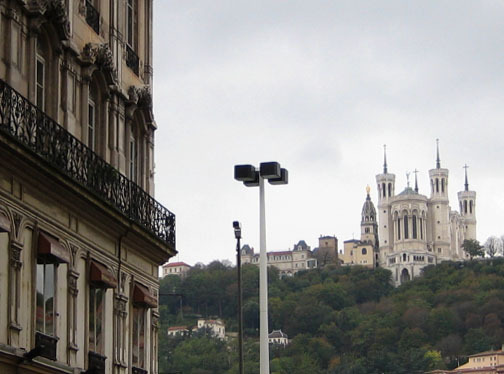 I guarantee that after two hours in Lyon you will not want to leave.” “You win,” I told him but I held in my head the impression that Lyon would be a city of damp unadorned buildings with menus that featured Lyonnaise potatoes. So, after the warm October sun and the infinite yellows of southern France we stepped into a chilly plaza coated with light rain. 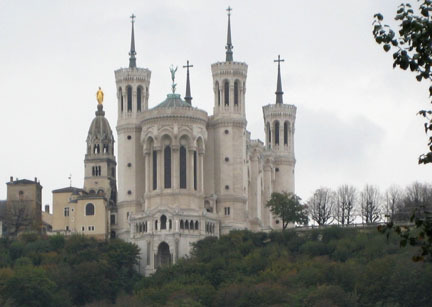 As we walked along its streets even he agreed that Lyon’s buildings were stolid and Germanic. It will be better by the river, Robert said, and so it was. The River Saone flowed with a grand sweep under stone arched bridges and a seducing sun came out as we walked along. He was eying a white cathedral high on a hill on the opposite bank. I could imagine the thousand steps up to it and suggested it was time for lunch. Because part of Robert’s job is eating he has acquired a sixth sense about restaurants. He needs only to walk by the entrance, and sniff the air. 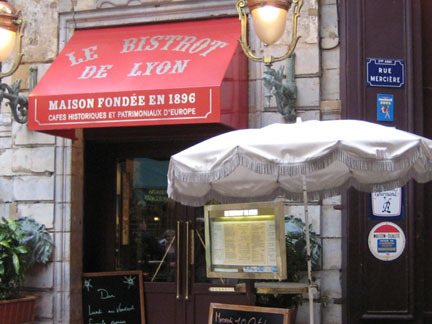 “This is it, Mom.” His choice, Le Bistrot de Lyon, was no different from dozens of others along the cobblestones of Rue Merciere, which, with its beat and bustle, seemed to be the food heart of Lyon. It felt right to me too. Le Bistrot opened itself to us. The maitre de was brisk but welcoming in that nuanced way the French have to be OK with Americans. We were seated at a small table with a white tablecloth and a pot of fresh flowers in the non-smoking section where smoking was still done without guilt or irony. Nearby a table of businessmen, six or eight of them in dark suits, were finishing up a platter of pork roast and sausages. A waiter poured from several bottles of wine set about and discussed their desserts. Good humor flowed between the waiter and the men in their rumble of conversation. The décor was all polished brass and Persian carpets of faded reds, oranges and blues, The sconces on the walls were converted gaslights. In the mirror behind the men I could see our heads; Robert’s curling black hair, and mine, graying, had developed that “certain age” sway. Had I worn a cloche it could have been 1944. The waiter turned from the men and at once became our waiter as he placed a basket of bread on the table. When Robert spoke to him in fluent French his surprise showed in two dots of red on his cheeks. He wore a white shirt and a bold cerise tie and an apron with a casual hitch up the front. We ordered the specials and a half carafe of local red wine. The bread had deep crust and yielded dough that was thick and nutty, the color of caramel. Two small salads arrived –arugula with herbs and a garlic mustard dressing. The wine, hearty and fruity, tasted of grapes laced with primroses or cherries. And then the entrée, mine a slice of medium rare beef lightly covered with a sauce of orange cognac and butter and potatoes cut with edges crisped by caramelized onions. Another waiter joined up with ours, a dark skinned younger man, an apprentice perhaps. He observed our pleasure in the food and gave us two desserts instead of the one with the special. A small cheese plate, and an apple crisp that was so good I wanted to stand and scream. It crunched with the light, buttery shell and sugar and the freshness of the apples. The check was modest and correct for such a simple lunch. But the confluence of care in the cooking, the colors, the way it was served by waiters who enjoyed the work, their reserved humanity and the happy hum of the businessmen, all this did something to us. It opened our feelings, which is a rare thing for a restaurant to do. In the past Robert and I had wounded each other after the divorce from his father. That day my faith in his judgment, his willingness to take me in hand and the mysterious magic of the Bistrot softened some of what had been hardened from all that. Outside the streets of Lyon looked entirely different. Robert went on to the white Cathedral and I walked about the shops and plazas in a daze. Later, on the train Robert wrote the following in his Journal. The city had seemed sober and northern and monochromatic –completely without spark—when we arrived, hungry, into a gray noon, with apparently a fine mist between us and any color the city might have had. By the time we headed back to the train station at 4 PM, the invisible mist had lifted, my belly had been satisfied, I had sweated my way up to the city’s heights, my intellect, or rather my vision, had been braced by an extra post lunch coffee, the sun had grown stronger behind the clouds. So that now the martial rows of houses along the river revealed previously unseen blues, pinks, and yellows–still all very restrained. Gradually too, more direct rays had penetrated the weather and produced their shadows, and with them the facades and the very bend in the River Soane with its curving heights were revealing the nuance of a third dimension. In Paris we had many fine meals but never one like the lunch in Lyon. I met Shirley Lupton in a writing class and was impressed by her cool, sardonic (is “sardonic” a combination of “sarcastic” and “ironic?”) Dorothy Parker-ish take on life, at least as expressed in her manuscripts. The first story by Shirley I read had the wonderful title “Nicole Kidman’s Bathrobe,” and was every bit as funny as the title suggests, but it also contained some very interesting insights into human relationships. Later, as I got to know her as a friend, I concluded that my initial impression held up. Shirley proved to be as witty and as insightful in real life as she was on the page. This entry was posted on Wednesday, March 11th, 2009 at 11:48 pm and is filed under essays, humor, non-fiction, short fiction, travel, vacation, writing. You can follow any responses to this entry through the RSS 2.0 feed. You can leave a response, or trackback from your own site. It’s a little after nine o’clock, and I’ve just finished dinner. Thank God! As I began the essay, I felt full… content even. Not anymore. I’m starving for a taste of those potatoes… lusting for a sip of that wine ( and I don’t even drink! ). Thank you for reminding me that there is more to a meal than just grazing, and showing me a teeny bit of Lyon. Much appreciated. What a wonderful piece–beautiful writing, so well executed. The theme made me think of “Babette’s Feast”…Wonderfully chosen details, Shirley. I will slow down and think of this essay the next time I have friends over for dinner. And Jim–a great postscript/assessment! Delicious article. Enjoyed reading it and imagining myself taking a bite. Lovely and well-written, with descriptions that are unique to Shirley’s work. And the pictures added a touch of “je ne sais quoi”. How I miss reading Shirley’s witty essays. I have known Shirley for years, since a group of couples, divorced or about to be, shared elaborate, home-cooked dinners together. I’ve always enjoyed my conversations with Shirley, but I never knew until now how vivid and clever a writer she is. This “restaurant review” is couched within a loving tribute to her son. I love the details: Robert climbed to the mountaintop, Shirley shopped, both returned to Paris full and happy.